This sculpture collection is all about mushrooms. The pieces in this collection have a characteristically pure organic style of rich wood textures and the unmistakable mushroom design. It is a fine representation of the artist passion for concept of Art & Function. 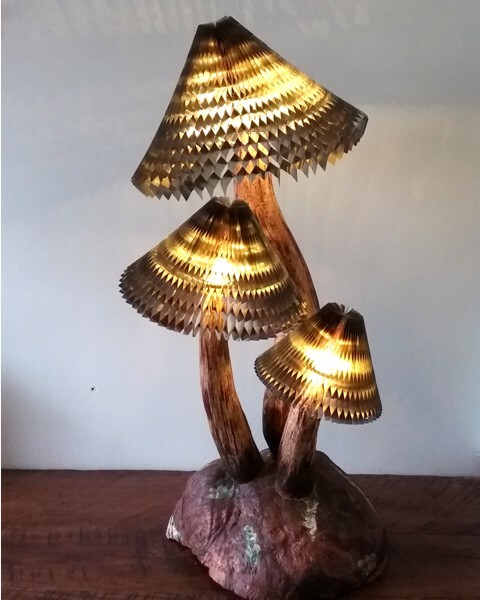 The stems of the fungi is hand carved out of solid maple using an axe which also has been hand made by a blacksmith in Sweden. An amazing tool ! 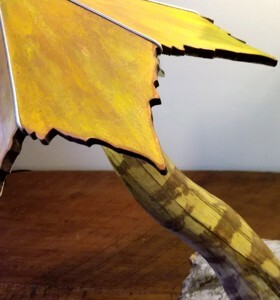 The main stem of this sculpture soars from its base ready to touch your imagination. 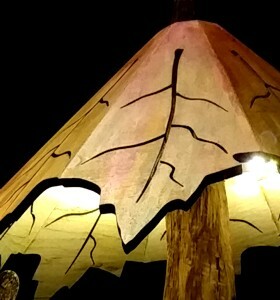 The shade have the complex outline of a white oak tree leaf. 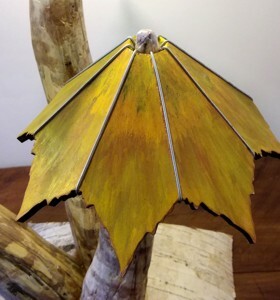 A rich and vibrant green finish complement this substantial lamp sculpture. 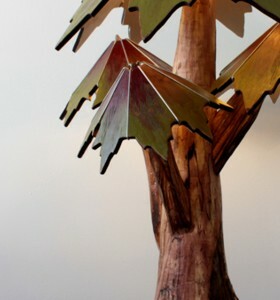 This lighted sculpture is equipped with a low power LED light source. Dimensions: 25" x 16" overall, 8.5" diameter shade. The honeycomb structure of the shades allows light to bounce off of the octoganal shapes, creating an aura of light around the sculpture. 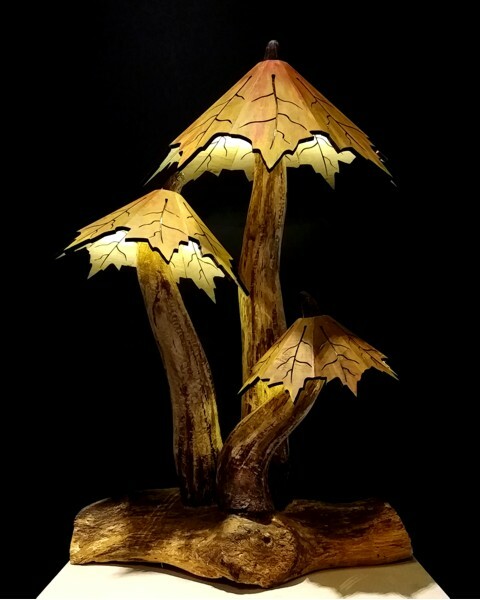 The stem is hand carved maple with interesting deep wood grain features. 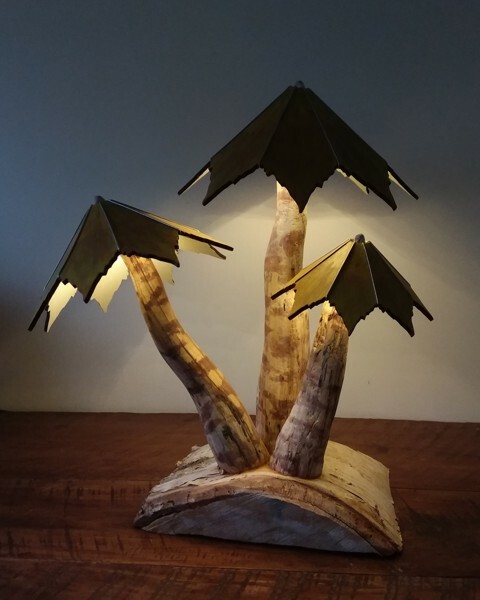 This lighted sculpture is equipped with a low power LED light source. Dimensions: 11" x 6" base, 12" diameter shade, 20" tall. 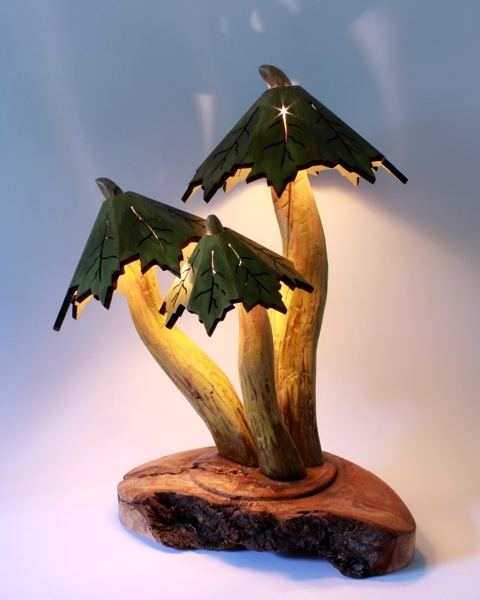 This lighted sculpture sits on a beautiful burly cheery base, the green caps have figurative piercings letting slivers of light escape through the solid wood shade. 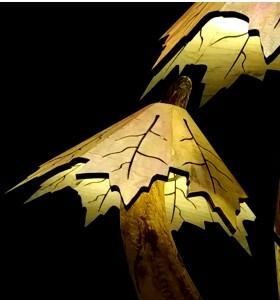 Hand carved maple stems. 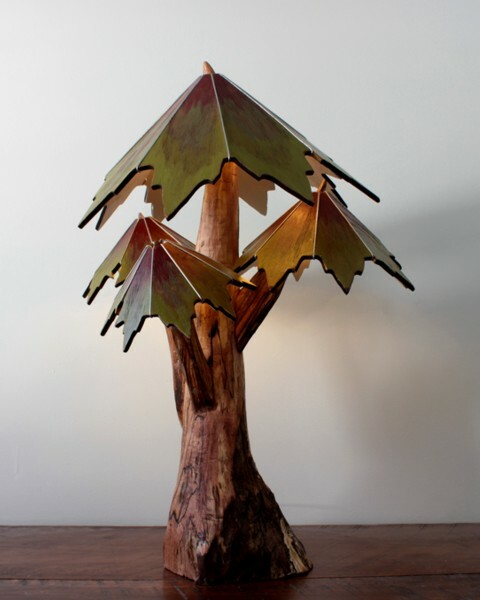 This lighted sculpture is equipped with a low power LED light source. Dimensions: 10" x 10" base overall, 15" tall. 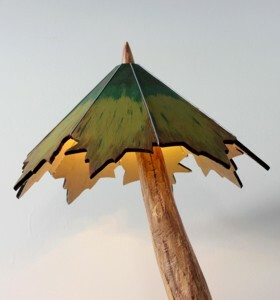 The trunk of this oak tree lamp highlights the beauty of spalded maple's random colors. 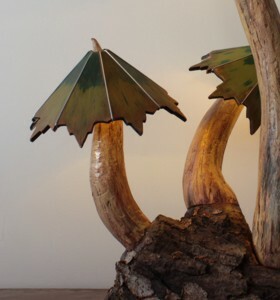 It is composed of four branches topped with oak leaf inspired design shades with their complex outlines . 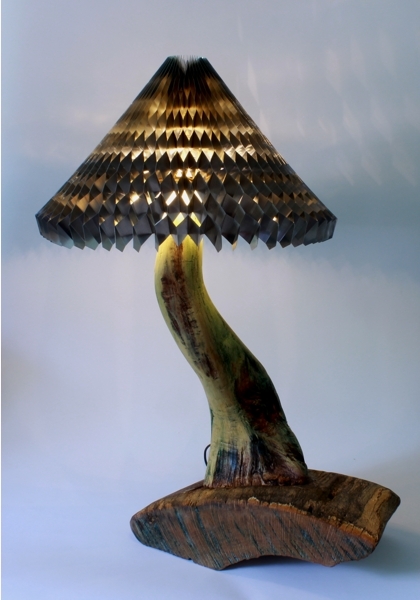 A rich and vibrant green finish complements this substantial lamp sculpture. This lamp is equipped with a low energy LED source. Dimensions: 24" x 12" overall, 8.5" diameter shade. Autumns in New England are like no other on earth. It’s a time of year when the trees are ablaze with color, a spectacular end to the trees’ growing season before they rest for the winter. 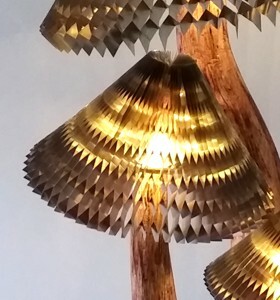 This piece is a tribute to New England’s autumn foliage, the caps have figurative piercings letting slivers of light escape through the solid wood shade. 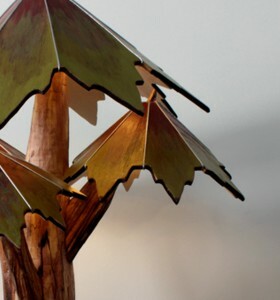 This lighted sculpture is equipped with a low energy LED source. Dimensions: 30" x 18" overall. 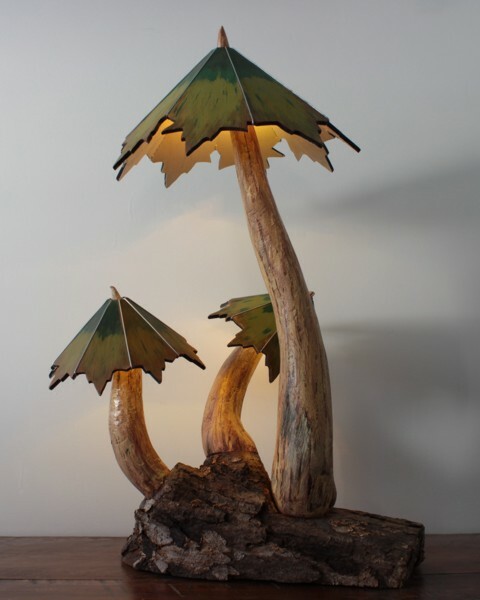 This impressive lamp stands almost three feet tall. Its base is a beautiful maple burl finished with a light stain. The sturdy stems gently curve up, decorated with textured colors. 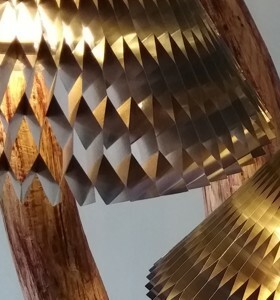 The honeycomb structure of the shades allows light to bounce off of the octoganal shapes, creating an aura of light around the lamp, and interesting reflections on the surfaces that surround the piece. This lamp is equipped with a low energy LED source. Dimensions: 36" x 16" overall. Those of us who live in the climes of New England reach a moment each year, usually in March, when our longing for spring’s return is palpable. This piece was created in anticipation of spring’s long-awaited arrival. The design takes inspiration from the majestic white birch. This lamp is equipped with a low energy LED source. Dimensions: 20" x 16" overall.